The Montbrillant hotel is situated in the centre of Geneva, at the Cornavin main train station, offering direct access to public transport and good connections to the airport and the central business area. It takes you only a 3-minute bus ride to reach the UN and within a 5-minute walk you can reach Lake Geneva, the old town and the business centre. 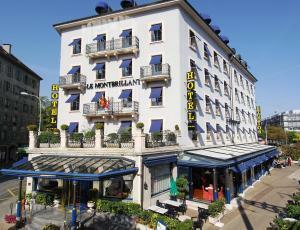 The Montbrillant hotel is entirely air-conditioned and offers wireless internet access free of charge. The rooms feature a typical Swiss decoration enhanced by artistic paintings, stone walls and exposed wooden beams. All bathrooms have a heated towel rail. You can park your car for free on site!